Blinded but desperation and lust, another man falls victim to a prostitute scam and 37-year old Loh happened to be that man, reports The Star. Loh describes how he was so smitten by a pretty lady known as “Ann Ann” when he came across her profile on July 23. Wanting more than a ‘see-no-touch’ relationship with the woman, he then added her on WeChat, a site akin to WhatsApp. Gatalnya..
“She was really beautiful. I added her on WeChat and she revealed that she was a prostitute and offered services for RM600 a night,” he said during a press conference by MCA Public Services and Complaints Department. On Aug 11, Loh and the woman had arranged to meet at a convenience store close to shopping mall, Sungai Wang Plaza, but Ann Ann broke her promise and didn’t turn up. Shortly after, Loh then received a text message advising that he’ll need to make payment in advance via RM600 worth of Money Online points. But that was not all. “She demanded an additional RM2,000 worth of Money Online points as ‘risk management fee’,” he said. Loh was also assured that the risk fee was refundable. You’d think Loh think that his ‘lady friend’ was asking a little too much at this point. I mean the woman is literally asking for more than 300% of the fees upfront and he hasn’t even seen the ghost of her. Anyhow, the man paid a total of RM2,600 so far. But just as you think it’s over, Ann Ann asked for another RM3,000 as she claimed that it was “insurance fee”. Loh then made a payment of RM300 but stopped as he sensed something was fishy. “A man then called me and threatened to break my legs if I didn’t pay up. I was again told that the money was refundable,” he revealed. Loh had then a police report of the incident. It was later revealed that Loh might not have been the only victim. Not knowing who else to turn to, Loh appealed to the MCA (Malaysia Chinese Association) Public Services and Complaints Department chief Datuk Seri Michael Chong for help, whether if there’s any chance he could recover his losses. 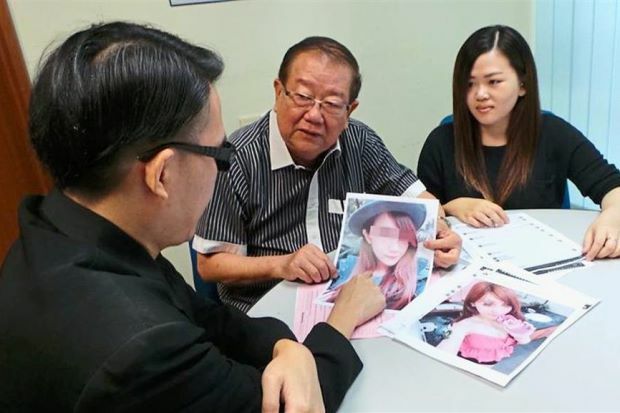 However, Datuk Seri Michael Chong believes that this case is part of a scam that are using ‘fake’ profiles and having images of pretty girls that were found online. “The syndicate may have used an innocent woman’s picture to lure potential victims,” said Datuk Seri Michael Chong. As bewildering it is for us to comprehend that people nowadays would actually fall into these scams, it is literally still happening! So always be alert guys.